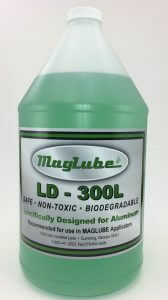 Our most popular aluminum lubricant is MagLube LD-300L. Many of our customers have told us this lubricant is far superior to all other aluminum lubricants on the market. We couldn’t agree more! Our R&D, trial and error during the creation process of this product resulted in a perfect blend for all aluminum machining. This is a non-ferrous lubricant and is a room temperature liquid possessing low viscosity, light color, and excellent lubrication properties. It will not attack rubber or plastics. It is used on critical applications as it will not leave any mess or sticky residue. LD-300L has excellent lubrication properties that make it useful in a wide variety of lubrication applications. Transparent color and low pour point make LD-300L particularly useful in processing of aluminum as well as the textile industry. Other applications include but are not limited to cutting tool lubrication in metalworking as well as woodworking, chain lubrication, roll forming, medical instruments, food processing machinery. It can be purchased in 1-gallon containers, 5-gallon pails, 55-gallon drums and 250-gallon totes. While MagLube LD-300L is our most popular aluminum lubricant, we also have a multi-purpose lubricant that many customers prefer as they can use it on other applications because of its versatility. This multi-purpose micro-lubricant is our MagLube MD-200. It can be used with aluminum but also wood, plastics and other types of materials.